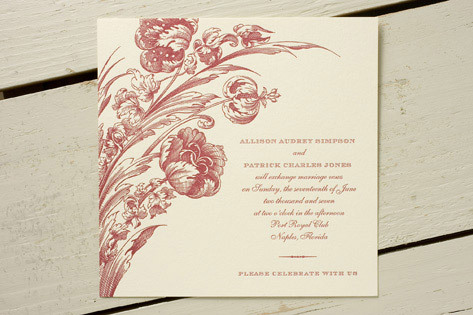 A stunning bouquet of opulently illustrated tulips bends eleganty toward the wedding event details in this upscale letterpress wedding invitation. The invitations are printed on Crane Lettra paper in ecru, and the suite includes options for pocket folders, ribbons, and decorative paper. Available in merlot (shown), leaf/espresso, begonia/black, and fuchsia. Fonts shown are Mrs. Eaves and Shelley.